I’ve already mentioned this a few times before, but Thai curry pastes are the foundation of Thai cuisine. 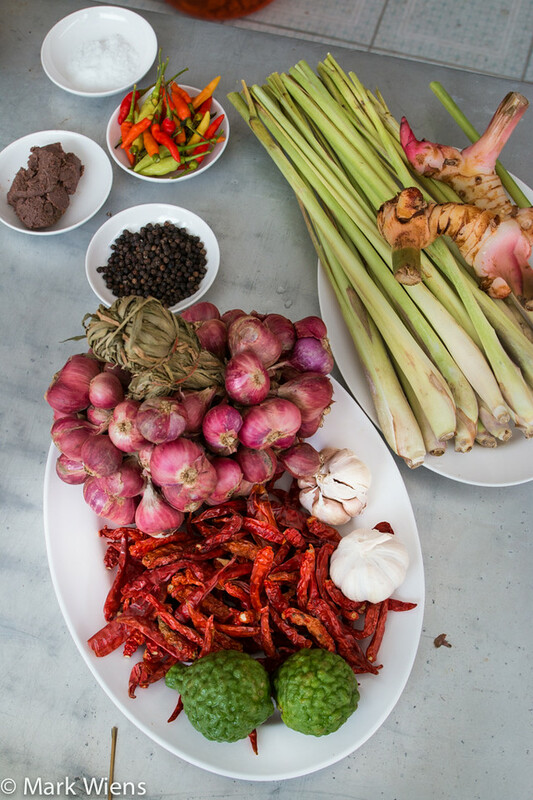 They are not only used in making a different variety of Thai curries, but they are also the spice and herb mixture that gives flavor to soups, and many different Thai stir fried dishes as well. 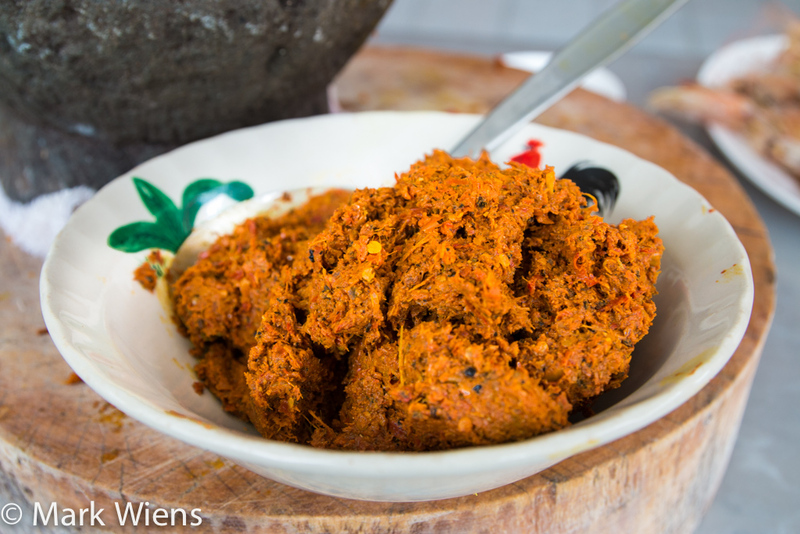 You already know how to make Thai red curry paste, but since my wife is from the south of Thailand, one of the most common Thai curry pastes we have sitting around our home in Thailand on a daily basis (and a paste my mother in-law cooks with frequently) is called kreung gaeng ped dai (เครื่องแกงเผ็ดใต้) – or southern Thai style curry paste. NOTE: The south of Thailand is the Malay peninsula part of the country, usually beginning in the Prachuap Khiri Khan province, and all the way south to Malaysia. While many of the ingredients are similar to that of other curry pastes in Thai cuisine, you can normally recognize southern Thai curry paste because of its distinct yellow color, a result of adding fresh turmeric to the mixture. 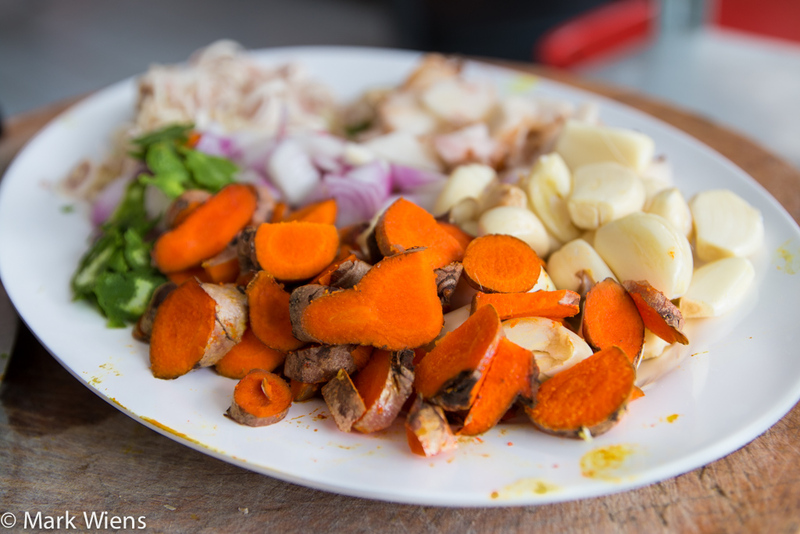 As I start to share more southern Thai recipes, you’ll start to see that southern Thai cuisine makes frequent use of fresh turmeric – especially in soups and curries and pastes, and even in fried fish. 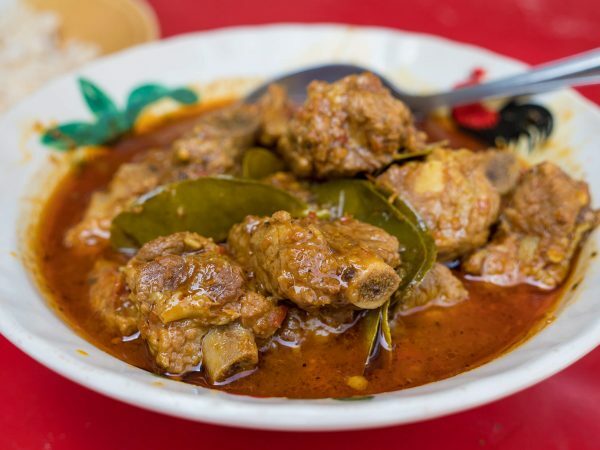 Another distinction between southern Thai curry paste and other curry pastes is that it usually contains a higher amount of shrimp paste, which is a popular flavor enhancing ingredient in the south of Thailand. Thai shrimp paste gives the curry paste its salty component, and although it might smell quite strong on its own, it really combines well with all the other ingredients and you’ll hardly smell or taste that pungent fermented shrimp paste when you’re cooking with it. All that to say, don’t omit or substitute the shrimp paste, it’s essential. 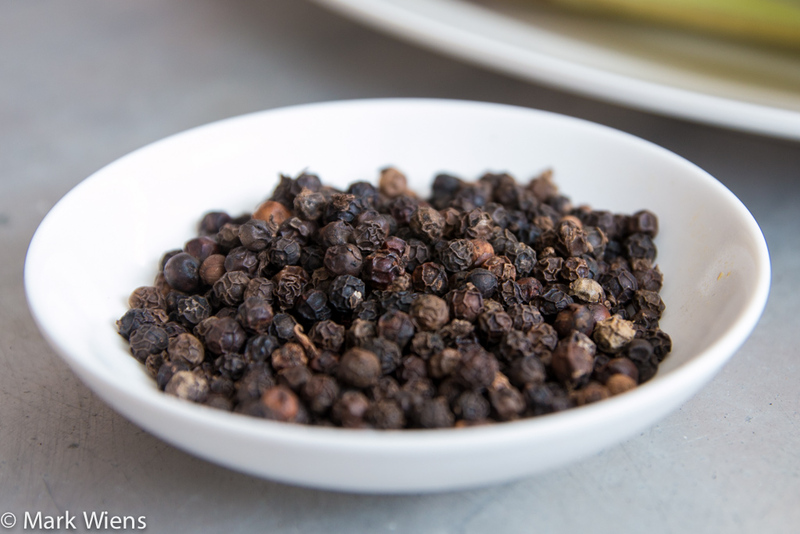 Normal dry black peppercorns are also one of the main ingredients in this recipe, providing a bit of extra heat, and that wonderful strong black peppery flavor. 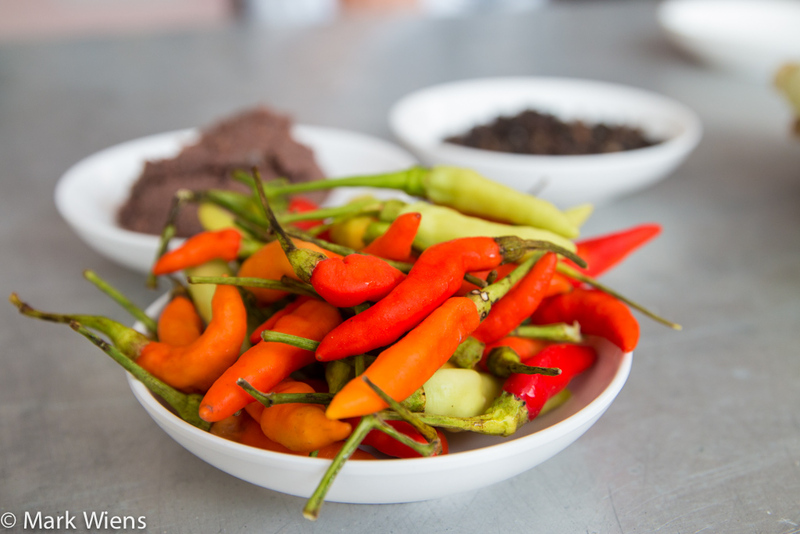 One of the things I love about southern curry paste is that the recipe includes both dry Thai chilies, known in Thai as prik haeng (พริกแห้ง), as well as fresh Thai bird chilies. This gives the curry paste not only that dry smokey flavor, but also that fresh green chili flavor as well. 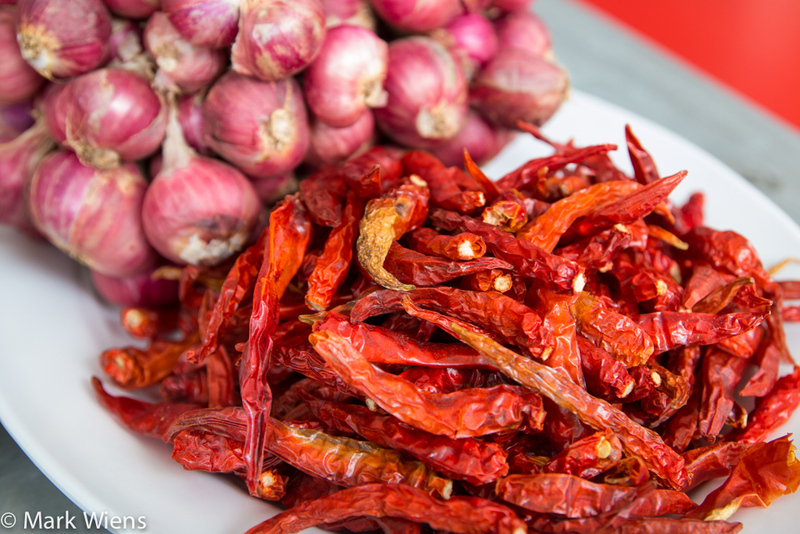 The prik kee noo (พริกขี้หนู), or fresh Thai bird chilies, are not only spicy with heat, but they are also so fragrant and when pounded, they release oils and chili juice. Ok, now that we went over some of the key ingredients for this recipe, I’ll just list everything here, but you can also go below to check out the more official recipe box. That’s all for the ingredients, now let’s get started making it. Just like other Thai curry paste recipes, the method of preparation is actually quite simple, it’s just time consuming – it takes a long time to get that smooth buttery paste that you’re looking for. Basically just take all the ingredients, slice them into thin small pieces, and then start pounded away, until all the ingredients have turned into a paste. I often start with the chilies, and then keep adding other ingredients as I go along, but really, as long as everything is in there and blended together, it doesn’t really matter what order you add everything. In the video (watch it below), you’ll probably notice that I actually have to take my mortar and pestle down to the floor, in order to get more leverage and be able to pound from above – it really helps. There is one exception though… you don’t want to add the fermented shrimp paste until the very end, when you’re just about done pounding. 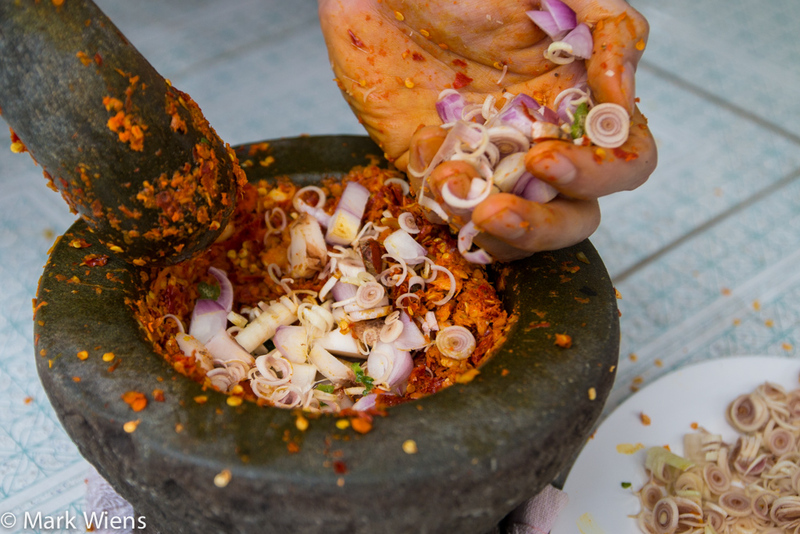 The shrimp paste is already a paste, so it doesn’t need more pounding, and as soon as you add it, you’ll find that your curry paste gets extremely sticky and thick and takes a lot more power to pound. At this stage of the recipe, you really don’t need to do much other than just keep on pounding and pounding. You’ll slowly see your southern Thai curry paste going from chunky and being able to recognize all the ingredients, to smooth and oily. And how could you not love that beautiful color of the fresh turmeric? Why not use a blender or food processor? You might be wondering, why not just blend up all the ingredients, or throw everything into a food processor? That’s a great question. The reason to pound everything by hand is that when you grind and bruise all the ingredients, they slowly release all their oils, which translates to flavor. And this doesn’t happen as well when you quickly blend them all up. 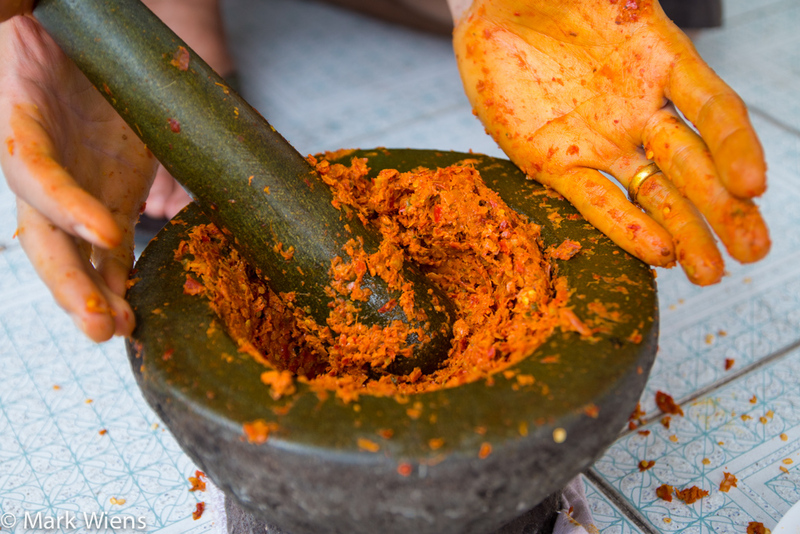 However, if you don’t have an hour or two to prepare the curry paste, it would still work to use a blender or food processor. WARNING: Touching chilies while making curry paste can make your hand burn (feel likes it’s on fire! ), so even though I didn’t wear gloves in the video, it’s best to wear gloves if you can. For more Thai recipes click here. Thai curry pastes are essential in preparing Thai cuisine. Today I'm going to show you a recipe for a southern style of Thai curry paste, which makes the base of a number of different popular Thai dishes in the south of Thailand. 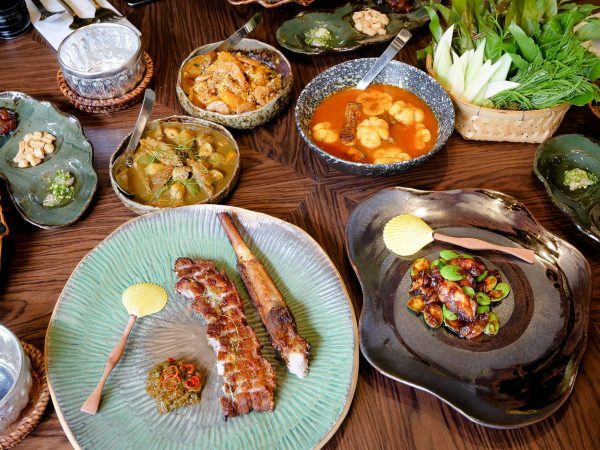 If you can master this recipe, you'll be cooking some extremely delicious southern Thai dishes in no time. Be sure to check out the video of this recipe here. The first steps are just to prepare a few of the ingredients to be pounded. 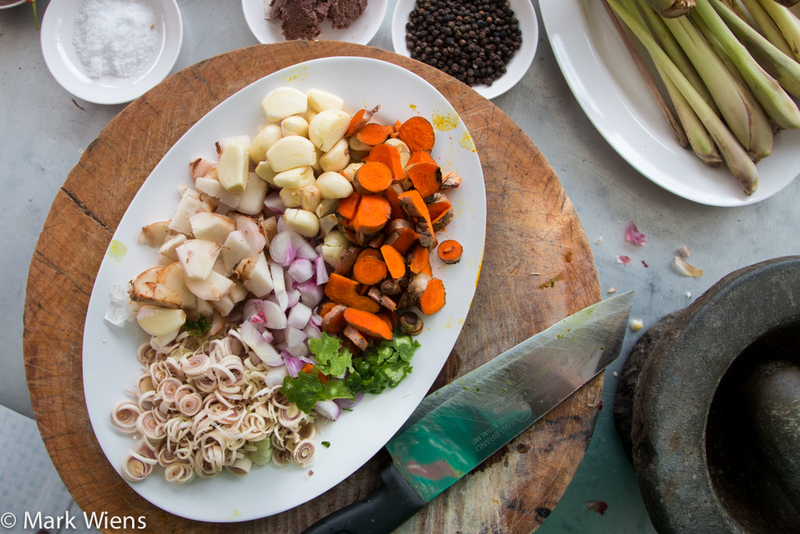 Take the turmeric root, galangal, and shallots, and dice them all into small pieces. Doesn’t need to be too small or evenly cut, this is just going to make it easier to pound. Set them all aside on a plate. For the lemongrass, first remove two or three of the outermost layers (the outer layers of the lemongrass are tough and not flavorful). Start from the bottom (thicker side) of the stalk and cut off the end, and then slice it into thin slivers, about half the way to the top. Toss out the top half of the lemongrass stalk as its not flavorful and it’s tough also. Set it aside. Take your kaffir lime and carefully slice off the outer green bumpy skin. You want to slice only the outer green skin, without getting the white pith. Cut the green skin off about half of the lime. 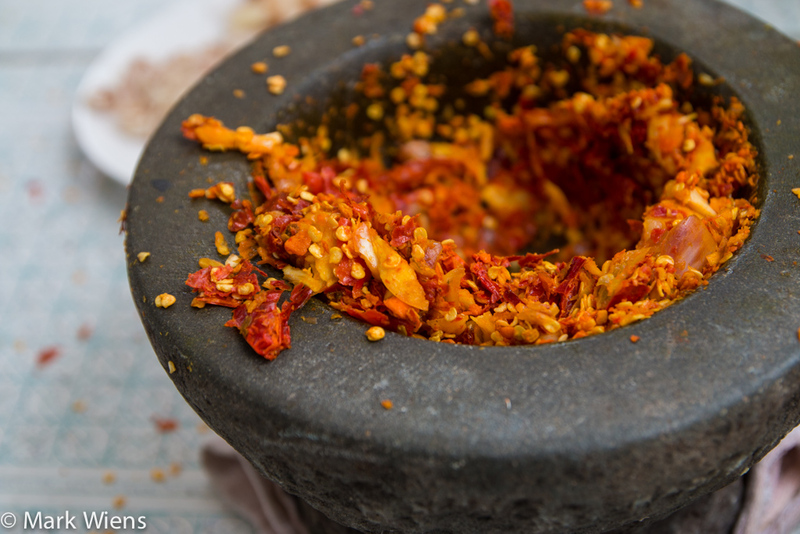 Using a mortar and pestle, start pounding the dry Thai chilies first. They might be a little bouncy as they are dry, but the more you keep on pounding them, the more they will loosen up and their oils will start to form. Once you’ve pounded the dry chilies for about 10 minutes, add the fresh Thai bird chilies - you can add the stem and all. This may help add some moisture to your curry paste. Keep pounding, maybe for about 15 minutes or so, until the chilies are broken down. Start adding pieces of turmeric, garlic, and shallots to your curry paste, and keep on pounding and pounding. If your mortar and pestle isn’t big enough, you may need to put some of your paste into a separate bowl and do a couple batches. Gradually add in all the lemongrass and the kaffir lime peel and keep on pounding. It took me over an hour to pound this southern Thai curry paste. You don’t want any chunks, and you want to fully release the oils of all the ingredients - that’s when you’re going to get the best flavor out of your paste. Your curry paste should be a nice oily buttery consistency and quite smooth when you're done. Then add the black peppercorns, and salt, and keep pounding until the peppercorns are completely pounded in. Keep on pounding until you have a beautiful pasty blob. The final step is to add the shrimp paste. Pound it slowly, more mashing it into the paste. It should get quite a bit stickier and dryer with the addition of the shrimp paste. 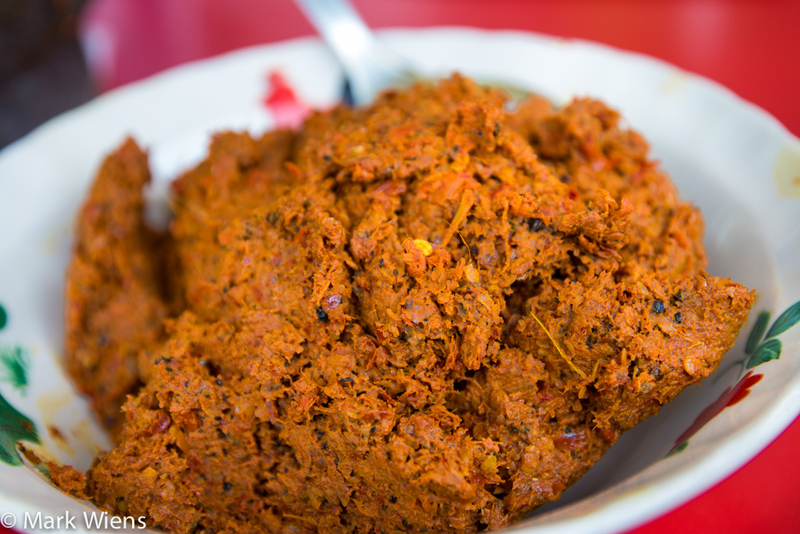 Once the shrimp paste is fully mixed in, your curry paste is ready. 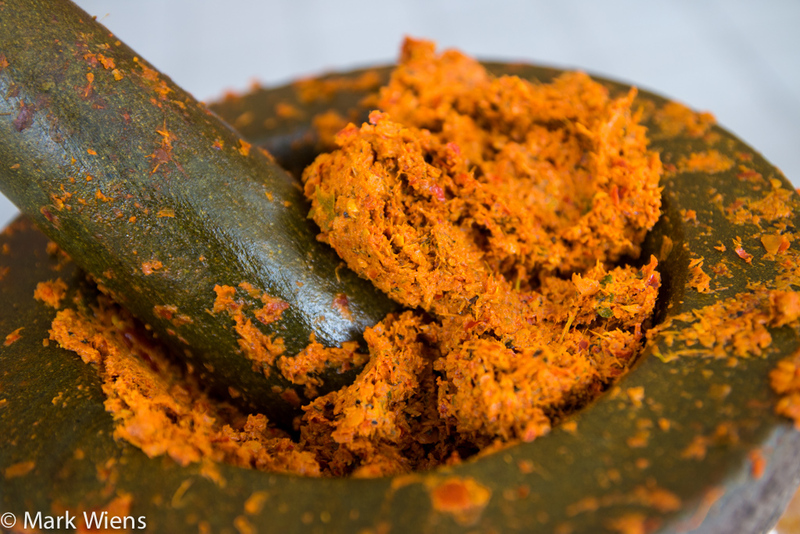 Making southern Thai curry paste is not too difficult, but it is just time consuming and it does take some serious arm energy. Basically for this recipe, all you just need to do is take all the ingredients mentioned above, and pound them using a mortar and pestle until they become a buttery paste. Though it does take some time and effort, I can assure you, the end result will be nothing short of incredible flavor. Although making Thai curry paste by hand is time consuming and takes plenty of energy, the end result of the flavor will not disappoint you. All those chilies, the garlic, shallots, pepper, lemongrass, turmeric, and galangal, and all their oils mingled together is a combination that can make anything you cook with it taste incredible. goong pad sataw (กุ้งผัดสะตอ) – Stink beans fried with shrimp (one of my favorite dishes in all of Thailand). If you loved this recipe, I would be extremely grateful if you would give it a 5-star rating, leave a comment below, and share it with one of your friends who loves cooking Thai food too. hi mark, is this the same as thai yellow curry paste? Made this just now but had to substitute dried powdered turmeric for the turmeric root. Used too much. How much of the powder is equivalent to 50 gms of root? Thanks for sharing such a great recipe but I was wondering why I can’t print this recipe or save it to Pinterest, which would make it much easier to use the recipe? Hi Mark! Just made this today..my arms are still sore! Question- what is the fridge life of the paste? incredible detail, thank you Mark!! How long would the paste be good for? Hey. I am a vegetarian from India. I can find all the ingredients here, but i seriously cannot and do not want to use the shrimp paste. Please help me out – give me an explanation pls as i do understand when u mentioned not to subsitute or omit it. I kno i wont get hte flavour without it. so what else can i do? i dont want an average curry paste. Hi. I suggest you to add any kind of fermented vegetables paste to your curry paste. 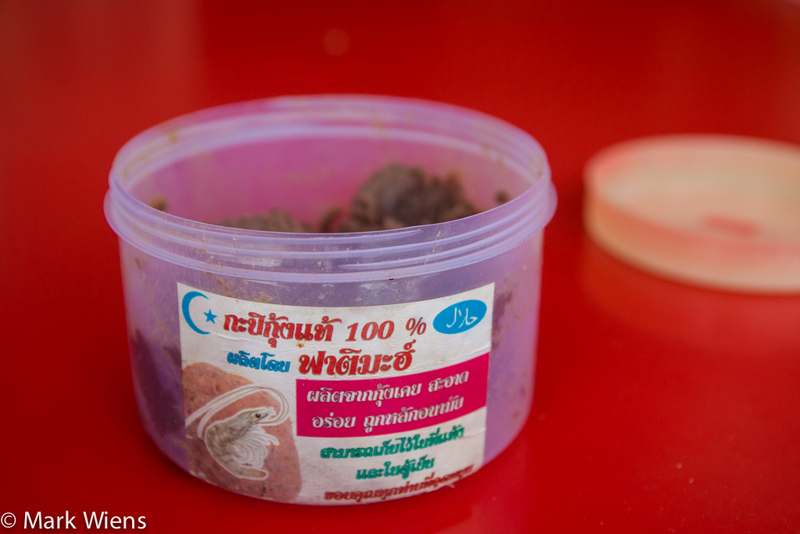 Well, shrimp paste is an important part of Thai curry, especially in southern Thailand. However, you can use salt instead of shrimp paste. I have heard of people using miso paste, which is a Japanese soy bean paste, to give it a savory element. However, there are several types of miso paste so you may have to check websites or forums dedicated to vegetarian Thai recipes to see what is used. So sorry you didn’t get an earlier reply and I hope you’ve found a solution. 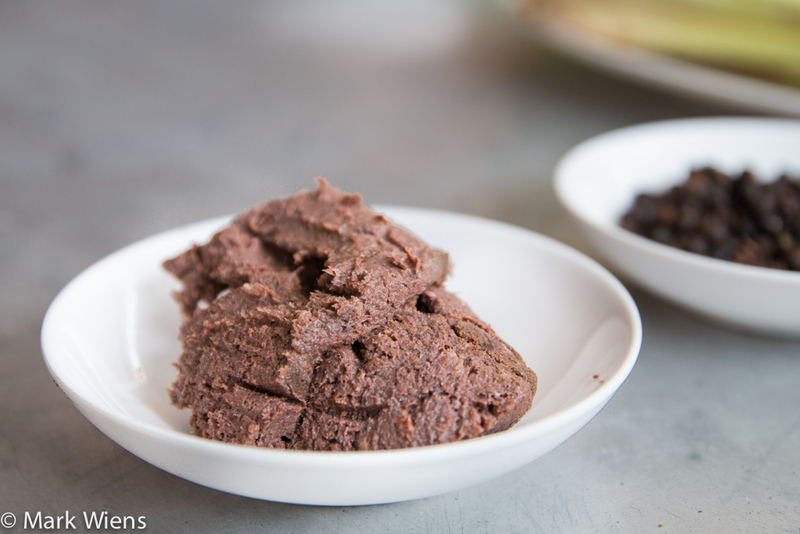 You can substitute gapi – shrimp paste – with miso paste; it gives you the saltiness and fermented flavour without the animal protein. Here in Portland, Oregon we have several large Asian markets on the south east side, and some great Thai restaurants. My favorite is Chicken noodle, and I get green curry sauce on the side. They make it with wide rice noodles, and I got those at the market, but the recipes I’ve found are for things that look like soup. Would love to make it if someone (like you) could post a video. It has green onions, lettuce, chicken, and noodles . It’s not soup like at all. Watched your mother in law make that wild duck. I bet it smelled wonderful but the peppers would have burned my face off. 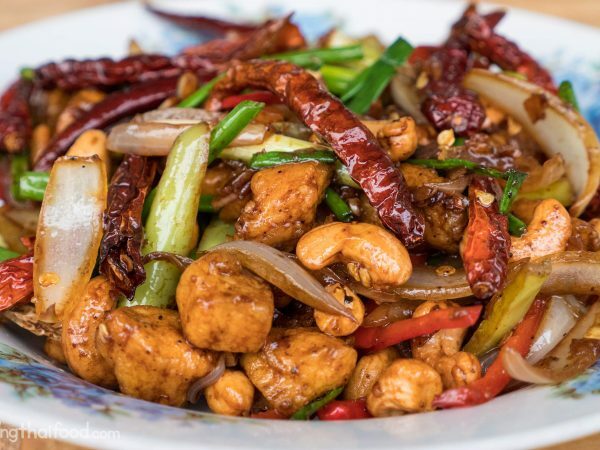 Being based in Scotland, I am trying to source all the ingredients that I would need to have a go at making this but I am struggling to get access to Kaffir Lime peel. do you have any idea’s on what would a suitable replacement for it? Other than this i am pretty much ready to go ahead, buy all the ingredients (and a pestle & mortar!) and give this a try. Love the site, keep up the awesome work. Lime or lemon peel can be used instead if kaffir limes aren’t available. Thankyou for the detailed recipe. Have tried making it and its delish! This is an awesome recipe Mark. An hour and a half of pounding for this Southern Thai Curry recipe. Hard work pays off in a delicious curry. I’ve been making ‘authentic’ dishes at home for some months now and luckily as I have dipped my toes into it I had access to pastes that aren’t generic off the shelf variety (including southern and sour pastes), but I was still nervous to try making my own paste, until yesterday! Awesome explanation and because I love southern Thai food so much this was the first paste I made myself, so thanks a million!! One question though; your recipe made quite a bit of paste, so any other recipe ideas other than the two you mention? My wife can’t eat legumes so that one is out, and I would love to try something else instead of khua kling. Thanks! OMG! This looks like work but I am so SO excited to try it! Your whole blog is amazing….Book marked you already lol.. Thanks for sharing! Been craving this dish for dayssssss.. I love wath your doing here, great recipes and noce photos. 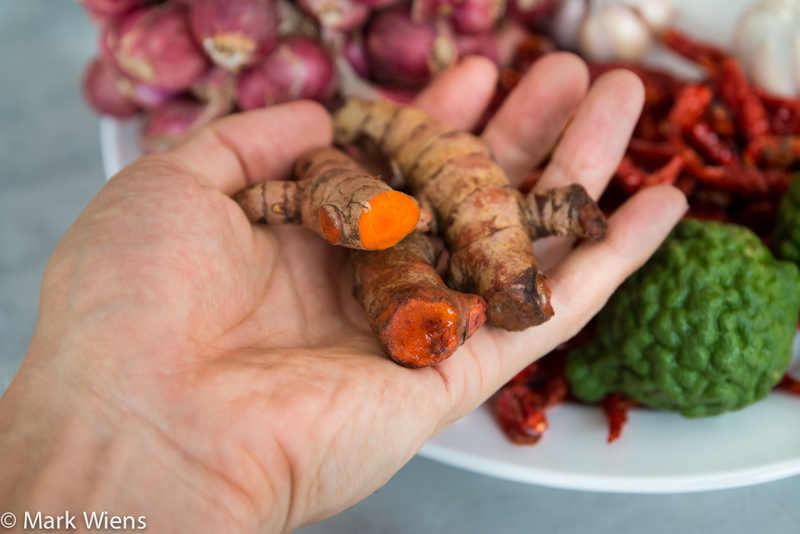 If I cannot find turmeric root, can I use turmeric powder instead ! Hi Kris, good to hear from you, thank you very much. Hmmm, I think turmeric powder should work, but you’d lack the oils from the fresh turmeric, but I think it will still work alright. Enjoy! I am so so happy I found you!!! You are just awesome, way better than any other celebrity foodies out there because you share recipes I can actually fOllow! Everytime I see your videos i want to eat. Thanks for sharing and keep up the excellent work!!!! Hey Cindy, thanks for the kind words, and awesome to hear that you can follow these recipes. Thank you and enjoy! Do I need to peel all the veggies? Hey John, normally I would only peel the garlic and shallots, but not the root herbs. 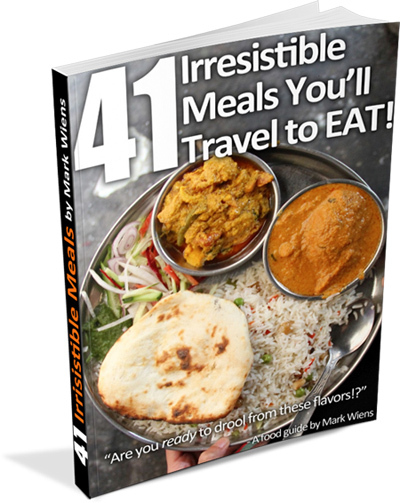 Hi Mark, love receiving you posts, find them very inspiring and makes me want cook the dishes (and visit Thailand!) which I will in May. Love Thai food thanks for the inspiration. Hey Tim, thank you very much. Wow, great news that you’ll be visiting Thailand soon! How long will this paste keep in the fridge? Great photography. Hey Emmet, it should keep for a couple weeks in the fridge. Thanks! SHRIMP PASTE not essential I eaten and made Curry for years.. And I am highly Allergic to Shrimp… For unknown Reasons The allergy become very common (perhaps due to pollution) .Fish paste is used as commonly in Thai cooking and easily replaced with Anchovy Paist. This looks wonderful. I tried making it but here in the Netherlands you can’t find those beautiful ingredients so easily. I found fresh bird eye chills, but they were green, and the dry ones I could not find, so I used something else, they were a type of small chillies from Sudan and I assume that they are much hotter then the dried bird eye chillies, much much hotter, because when I was frying it , all I could smell was hot chillies, and I was coughing like crazy, there were deffintly no beautiful aromas of lemon grass or any other ingredient except chilli. I was wondering if you can my be recommend a replacement to the bird eye chillies, I had no experience with them so I would not how they taste or how hot they are. Absolutely fantastic! Everytime I read your blog, the pictures just make me hungry! Hi Kiki, you can store it in either an airtight plastic bag or plastic box. I think it’s best to use it within 3 – 5 days because of the fresh chilies and garlic in the recipe, but you may be able to use it up to a week or so. With that much work, it’s freezer time for me. I live alone, and would have to use a lot of it, daily, and every meal. lol I’ve gotten very fond of the tiny frozen garlic, cilantro, and I forgot from Trader Joe’s. I’ve been collecting tiny and huge ice cube trays lately for pesto, stock, pastes, etc. I love my freezer. Good to hear that Jane! Your blog and this recipe is amazing! I’m gonna have to try this out sometime! I actually saw you on YouTube last year while I was trying to show my british friends how Malaysian food looks like while I was studying in UK. I’m so estatic that you’ve got ur own website on Thai Food and all the amazing recipes. Thank you Mark! Hey Amy, great to hear from you, thank you for your words of encouragement. Happy cooking! Mark, you’re going to have to get some software that recognizes my name and blocks my posts! Sorry for writing in so often but sometimes I just can’t help myself, like when I read your Thai southern curry article. I am very impressed with the way you and Ying have done the recipes and it makes for a great experience for the reader. First of all, you guys take lots of good pictures with a good camera which is awesome because a good picture is always worth a thousand words. If I see a tantalizing photo of a dish my mouth waters and I want to make it immediately. Secondly, you start from the very beginning with a pile of raw ingredients and then chronologically head through the recipe, the excellent photos and helpful hints and tips continuing all the way. I have plodded through the internet for many years now looking for good food stuff, but yours is the best I’ve seen and I am now a true fan of you, your videos, posts, and recipes. The Thai southern curry post like so many others of yours I’ve seen is absolutely excellent and I learned a ton from reading through it, the video link adding much like a Christmas present, additional glee. Continued success with your site and all your culinary endeavours Mark, I really enjoy your stuff and think you guys rock! I’ll only post once in a while from now on so you and Ying don’t think I’m a stalker..
Hey Neil, it’s great to hear from you, thank you for your extremely kind words and for your helpful feedback. So glad that you love to cook and eat Thai food, just a I do as well. We appreciate your support and we’ll continue to make more recipes and keep making videos about Thai food! I love to marinate fish with tumeric powder and a little salt and deep fry it! Yum! That sounds great DC. Turmeric is one of the finest ingredients.